Although Italian, Bandini was born in Cyrenaica in North Africa, where his family had gone when Italy began expanding its empire under Benito Mussolini. Lorenzo was only three when war broke out and the family moved back to Italy where his father, also called Lorenzo, was abducted and murdered in the latter days of the war. Times were hard after that and at 15 Lorenzo became an apprentice in a garage in Milan. He married the daughter of the garage owner and his father-in-law lent him a Lancia Appia Zagato in which to compete in the 1958 Mille Miglia. It was not his first event as he had raced on occasion in 1957 in a borrowed Fiat 1100 but it was his chance to make an impression and a class victory on the Mille Miglia did exactly that. He then bought a Volpini Formula Junior car and in the years that followed, as he made more money, having started his own garage business, he was able to serve his apprenticeship in racing with the Volpini and later a Strangellini. This led to the chance to race an old Cooper-Maserati for Gugliemo Dei's Scuderia Centro Sud in the non-championship Pau Grand Prix in 1961. 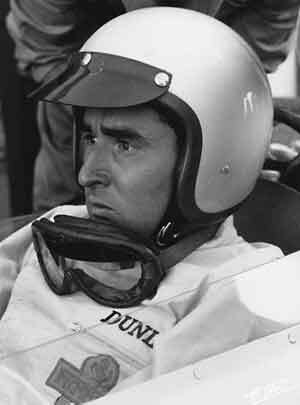 He finished third behind Jim Clark and Jo Bonnier. That year he competed in four World Championship events. He also made an impression with victory in the Pescara Four Hours with Giorgio Scarlatti in a Ferrari 250TR. He was recruited by Enzo Ferrari for 1962, although he did mainly sports car races. He only competed in three F1 World Championship events, coming third in Monaco. He also won a non-championship F1 race at Enna in Sicily. In 1963 Bandini was dropped from the Ferrari F1 team but that spring won the Le Mans 24 Hours, sharing victory with Ludovico Scarfiotti. He rejoined the reformed Scuderia Centro-Sud and raced a semi-works BRM that summer, qualifying on the front row in Germany, before being called back to Ferrari after Willy Mairesse was injured at the same event. In 1964 he won the Austrian Grand Prix on the bumpy Zeltweg aerodrome circuit after many of the other frontrunners went out with mechanical troubles, but for most of the time he was firmly number two to team leader John Surtees. His success in sportscar races led to important wins on the Targa Florio in 1965 (with Nino Vaccarella) and in the Daytona 24 Hours in 1967 (with Chris Amon). In the middle of 1966 Surtees walked out of Ferrari and Bandini found himself as the team's number one driver in Formula 1 supported by Mike Parkes and Scarfiotti. He led races but failed to win and by the middle of 1967 was under pressure. At Monaco he was chasing leader Denny Hulme when he crashed at the chicane and the Ferrari rolled and caught fire. Bandini was trapped in the car and suffered terrible burns from which he died three days later.